The origins of the cemetery are rooted in the feud in which the established church and the chapels were engaged locally in the mid nineteenth century. Non conformists were buried from early times at the church cemetery in Old Road, but their ministers were not permitted to officiate at the burials. When the funeral reached the cemetery gates, the Vicar took over. In 1850 a meeting was convened to discuss the possibility of obtaining land near the town for the interment of the dead of all classes, regardless of race, colour, or faith. Representatives on behalf of those denominations present agreed to buy a field of two acres. One of the rules adopted by the original trustees was that relatives and friends of the deceased could choose any minister recognised by the Baptists, Independents, Wesleyan or Calvinistic Methodists to perform the burial service. The administration has always stayed faithful to this original concept and a walk around the cemetery today will show that people of all faiths are buried at Llanelli Cemetery. It was in 1874 when the administration was broadened to include all the local chapels. As the town grew, so did the cemetery. Several extensions took place over the years and its development and expansion still continues to present times. Burials commenced in the latest extension in October 2009 and will provide burial facilities for approximately 50 years. 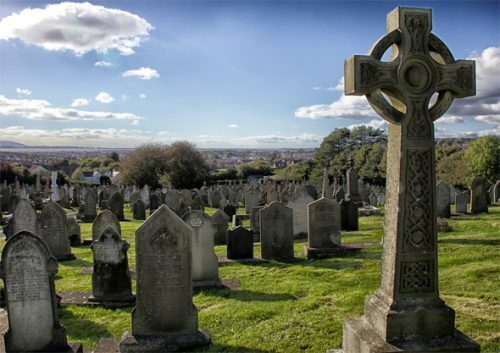 The cemetery was originally called ‘Llanelly’ Cemetery, or ‘Box’ Cemetery, reflecting the area of Llanelli in which it is located. It is not certain how the cemetery came to be known as ‘Box’. The district was referred to as ‘Box’ long before Box Colliery (one of the oldest in Llanelli), was established in the area at the beginning of the 19th century and certainly long before the cemetery came into being. The original burial ground is a typical example of a Victorian cemetery with an abundance of large monolith style memorials. The original sections are laid out in the typical manner of those times with the majority of graves facing east/west. In 1976 the trustees representing twenty two Nonconformist chapels agreed to sell the cemetery to the Llanelli Town and Rural Community Councils. The Llanelli Joint Burial Authority was formed in 1977; the cemetery was renamed once more and became Llanelli District Cemetery.